What a beautiful concept – to be creative EVERY day. Thanks, Leah, for the continued inspiration. I truly believe that each of us are creative, that we are here to create, and that we have a responsibility to be the creators of our own lives. Too often I meet people who say, “I’m not creative. I can’t even draw a straight line. Making art is just for kids.” WHAT? Why do we sell ourselves short? Why do we keep ourselves small? Why do we set such limitations and restrictions, to the point where we don’t know how to play anymore? Why can’t we call ourselves artists? How do we get to the place where we become complacent and accept “what is” rather than “what could be”? 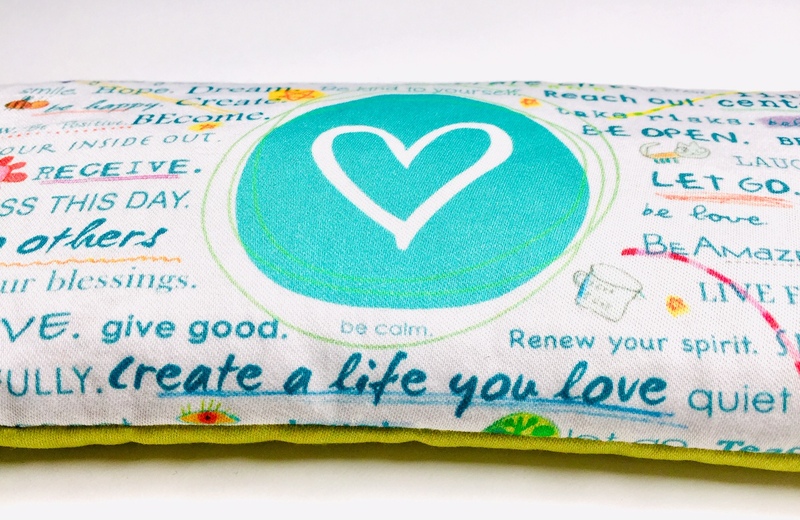 We all can create a life that is beyond our imaginations – a life that we truly LOVE. I can relate to many of these limiting thoughts, and for years I couldn’t call myself “creative” or “an artist”. Now, I find myself in a place where I can loudly say, “I AM AN ARTIST!” and I feel that my heart is more open than ever before. (To learn more about my creative journey, visit here.) Yesterday, my creative inspiration was sparked by my de-clutter December project. The clearing bug has such a hold on me that I don’t want to bring another thing into this house! So when I ran out of wrapping paper I quickly realized that I had to think up another solution because I was not going to run out and buy more! A bag of potatoes, a brown grocery bag – and an idea was born. 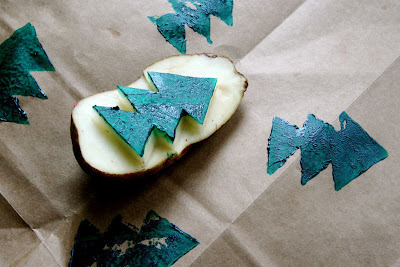 Add the paint directly to your potato stamp. Press the stamp firmly on your paper. I chose to be random with the placement, however, you may choose to create patterns. I love how the packages turned out! I’m so grateful that my de-cluttering continues to free up energy for new creative inspiration. 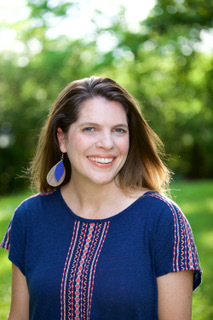 I also want to give a big shout out THANK YOU to Suzy, at Hip Mountain Mama, for interviewing me for her blog this past week. She is SO awesome and you must check out her “One Small Change” recycling project. 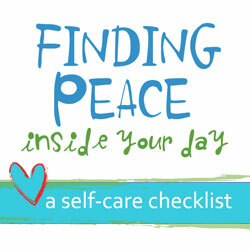 Your Personal Reflection: What positive changes do you experience when you de-clutter? 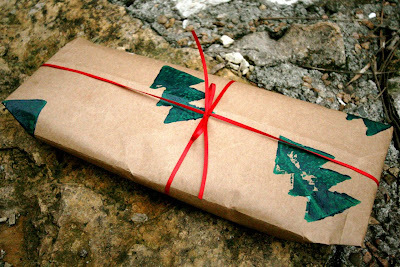 What creative recycling can you do as you celebrate the holidays this season? What is one small thing you can do, today, to nurture your creativity? Shan, I love your resourcefulness in creating your paper, and it looks so vintage. Not to mention "green" and recycled! 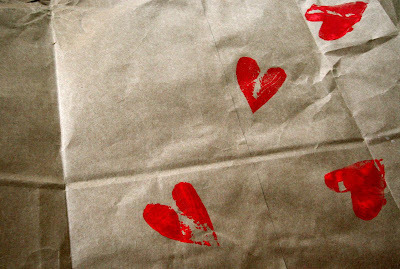 As I cut off a long piece of store bought paper, I felt a little guilty. Yes, you are so right in that continued thought of play, important to do each day. I'm reading an awesome book, "Happy for No Reason" which I think ties together with being playful, and happy from the inside. I've been de-cluttering my kitchen, and it feels empowering! Now on to putting drawers in my pantry! 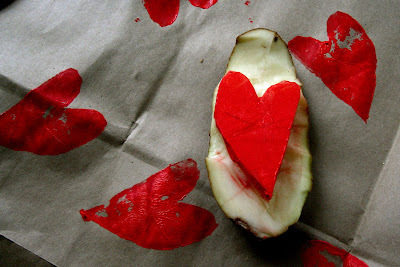 I was just talking about making potato stamps the other day to my daughter. She had NOOOO idea what I was talking about and as if on cue, you post here. Great idea!!!! Thanks. I was about to go to Target and buy wrapping paper, but now I think I'll make some! Potato prints are fun to do. 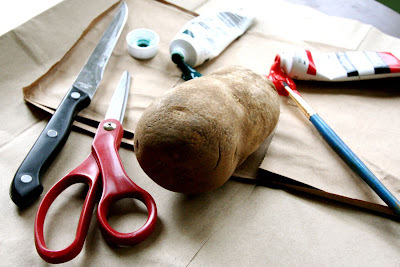 I haven't made my wrapping paper yet and may just have to pull out some potatoes. I love decluttering — I feel so open and ready for the next project. Hmmmm come to think of it, it is time for another round of decluttering. *love* this! 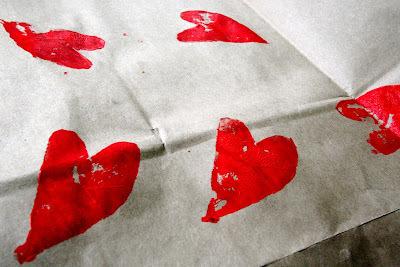 I've done something similar for wrapping paper before, but not with potato prints and I especially love how the heart one came out! Thanks to each and every one of you for your sweet comments today. I'm so happy that I could offer a bit of inspiration for you. What a FUN project this was. I want to potato stamp everything now! 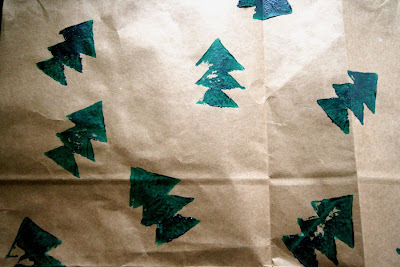 If you do make some wrapping paper this year, please send me a photo. I'd love to see what you create. Happy holidays! What a great idea! I'm buying potatoes tomorrow! i'm a HUGE horn-tooter of the concept that fewer materials = more creativity! love what you've done here! Hey again Shannon! Indeed I did buy a BIG bag of potatoes. Hopefully will be carving and stamping this weekend and probably eating potatoes too! Thanks for the great idea!